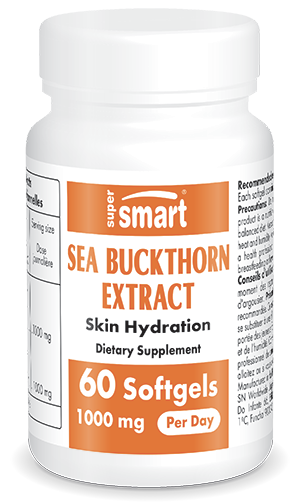 Sea Buckthorn Extract 500 mg | Multiple Health Benefits | Get Here! Contains a number of active substances (amino acids, vitamins). May reduce the toxicity of chemotherapy. Indicated in the prevention of cardiovascular disease. Sea Buckthorn (argousier) is a thorny bush from the Hippophae rhamnoides family with yellow-orange berries throughout the winter months. Using a non-aggressive, CO2-supercritical extraction process, it is possible to obtain an extract rich in a range of fatty acids - Omega 3 (alpha linolenic acid), Omega 6 (linoleic acid), Omega 9 (oleic acid) and, in particular, Omega 7 (palmitoleic acid), a much rarer fatty acid of which Sea Buckthorn is the richest source. The extract also provides a number of important unsaponifiables: carotenoids, tocopherols, tocotrienols and phytosterols, as well as several flavonoids and vitamin C.
Sea Buckthorn oil, used in Chinese and Tibetan medicine for its soothing effects on digestive and urogenital disorders, is particularly rich in palmitoleic and cis-vaccinic acids, both Omega 7 fatty acids. Scientists believe that certain tissues such as the skin and mucous membranes, lining the digestive and urogenital systems, have a particular affinity for Omega 7 fatty acids, which have almost disappeared from modern diets. The Omega 7 fatty acids in Sea Buckthorn act in a complementary, remedy and relief capacity and have protective, restorative, hydrating and rejuvenating effects. Sea Buckthorn extract offers not only a valuable, inexpensive way of compensating for the lack of essential Omega 7 fatty acids in the diet, but is also a nutricosmetic ingredient much-prized for its significant regenerative properties in all epithelization-associated processes. As is the case with most dietary supplements that contain oil, Sea Buckthorn Extract comes in the form of softgel capsules rather than standard capsules. This specific form of delivery significantly increases the oil’s bioavailability and provides greater protection from external agents (in particular light and oxygen). This extract of pulp (60%) and seeds (40%) provides all the active principles of the berry, in particular the precious Omega 7 fatty acid, palmitoleic acid (14-22%). Adults. Take 2 softgels a day with meals. Each softgel contains 500 mg argousier oil.